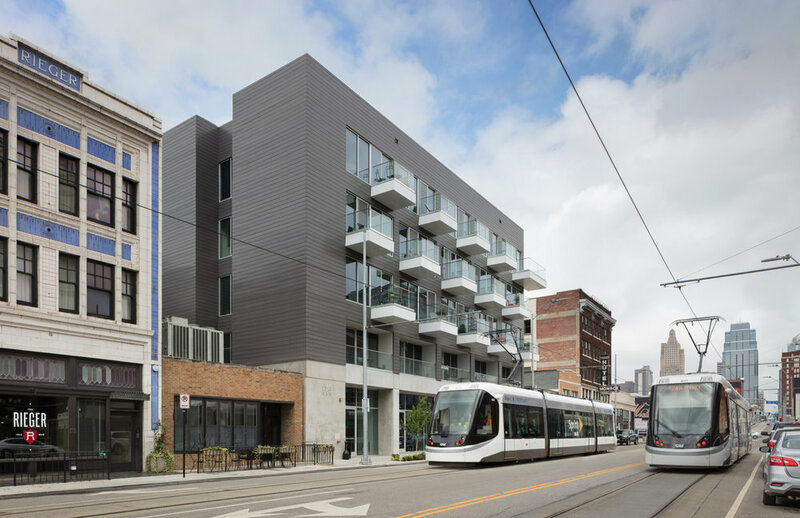 1914 Main Apartments is the first new-construction apartment building in Kansas City’s Crossroads Arts District and one of the first developments along the streetcar line. Utilizing public transportation such as the streetcar and B-cycle, 1914 supports a mobile lifestyle and aids in urban development. Unprecedented for Kansas City, this allows for a parking ratio of 0.5 cars/unit which maximizes space to the units, allowing for an open loft plan. Surrounded by some of KC’s best restaurants, bars, galleries and shops, the city becomes the amenity package. In KC’s creative district, the approach was to respond to the context and reinterpret the warehouse typology. To reinforce the “city as amenity” the units articulate themselves as portals to the city, maximizing views/light into the units. Streetside units connect to the city with projecting balconies, alternating per level to foster interaction and community between the renters, expressing the inherent movement of Main Street.